This is Juraci, the manager of a Padaria Comunitaria (community bakery) in Itapevi, a town in São Paulo’s periphery. 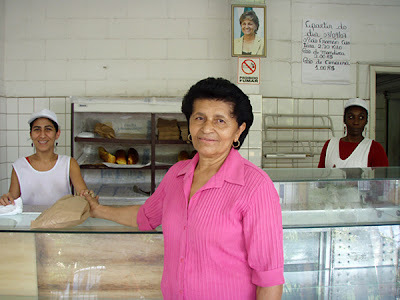 She lives a short walk away and has worked here for 15 years, starting at 4am and baking all morning, six days a week. With a mix of trainees, voluntary and paid staff, they bake and sell 3,000 Pão Frances each day, selling at R$2.30 a kilo (about £0.70, a third of the cost in central São Paulo). They also make cakes, pastries, and carrot bread, all sold at less than market prices, as are the wedding or birthday cakes that can be made to order. We arranged to document during their busiest time of the day, between 8-9am, with people on their way home from the night shift, on their way to their day job, or just buying bread for the day. The Padaria is run as an non-profit organisation with the support of Secrtariat of Social Promotion and the municipal city hall. All the ingredients – sugar, flour etc. are paid for and delivered by the local government. It’s also run as a training centre where volunteers and local teenagers learn how to bake. One of the bakers/teachers says the pay isn’t too good but she enjoys teaching and likes the people, so she stays working there. We learnt that for the Padaria (and others) there’s an inextricable connection between employment and who you vote for. This year there is a local election for a new mayor and councillors. If the current opposition win, some current staff will be made redundant to be replaced by the supporters of the winner. Juracy along with Julio, the padaria’s long-standing security guard, are civil servants so their jobs are safe. On one of our journeys to Itapevi, our friend Felipe said someone had said to him “why are you taking them there? It’s not São Paulo”. We spoke of the likelihood of these friends proudly stating São Paulo is the 3rd biggest city in the world with 22 million people. These 22 million include those in satellites like Itapevi, which make up the periphery.